Last week Mark and I decided we needed to get serious regarding learning the Spanish language. And the hunt was on for a Spanish instructor! We know words but getting them into sentences is just plain tough! While reading one of the forums, David, posted an interesting tidbit regarding a mammogram. His wife walked into a radiologist office and inquired about getting a mammogram….you know the usual “old country” questions – Do I need a prescription from a physician? Well, guess what friends! No order from a physician is required! So Marcia said “I’d like to make an appointment”…and the receptionist said “how about right now?” So in she went….afterwards, she inquired about getting the results and was informed “if you can wait 15 minutes, the test will be read right now.” She left that office with films in her hand! And for this wonderful experience she paid $40! Not bad, huh? I’ll be headed there and hope to have the same experience sometime in July. Somewhere in the emails back and forth with David to figure out where the radiologist is located in Grecia, we began discussing the Spanish language. He and Marcia have a “teacher”, William, that comes to their house once a week. William arrives on Saturday around 9 a.m. and stays till 11 a.m. or so, or until their brains are fried! David invited us to come to their house on Saturday morning to meet him and to sit in on their lesson. We really liked him! He had a sense of humor, which is extremely important to me, and even included us in their lesson. William is thinking about expanding into Atenas because of all the gringos in the area. We’re in the process of trying to get him pinned down on price, time and place. And we have a total of 6 people that are now interested. It’s a very informal, relaxed atmosphere. He inquires what you have done the past week and will be doing the next week. He explained, he’s not trying to be prying, and frankly doesn’t care if you tell him the truth or embellish – the key is to engage you in conversation. Keep your fingers crossed that this works out for us and the other 4 people! On another note, Terri arrives at 5 a.m. on Saturday…..so excited! She’s told me she doesn’t care if we spend all the time hanging around the house, or site seeing. There are a few places I would like her to see and some restaurants we must go to….but we’ll play it by ear. Pura Vida from the land of relaxation! 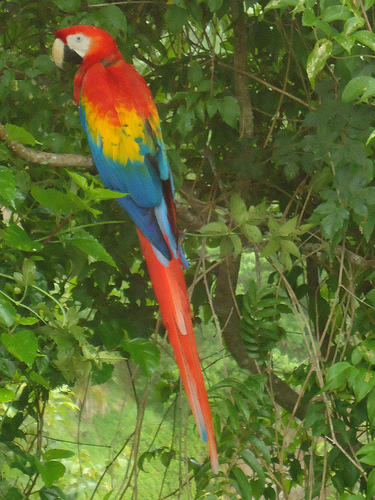 His response was “it’s a scarlet macaw”. Then he went on to tell me that Lee, his wife, had been hand feeding it bananas, crackers, papaya, etc. Said it had been hanging around since this morning. So I said “do you think it will still be there if I drive over to your place?” He said “sure, come on over”. Mark was taking one his “retirement naps” and I gentle asked him if he wanted to go….he mumbled “take the camera”! This was so cool to see! A neighbor was driving down their road and Lee motioned to him to look on their roof, which is where the macaw was originally. He stopped and told them it was too tame and was most likely someone’s pet that had escaped. 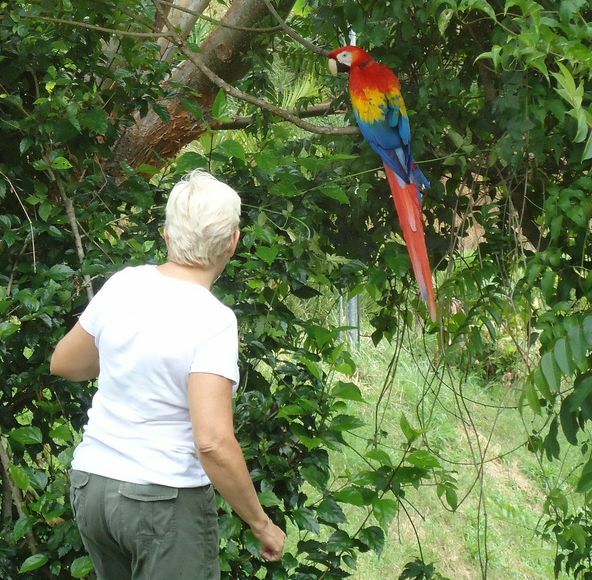 This neighbor actually had a macaw but got rid of it for some reason or another. Anyhoo, their neighbor called a guy from town who came out to see it. He was going to come back late in the afternoon and “rescue” it. 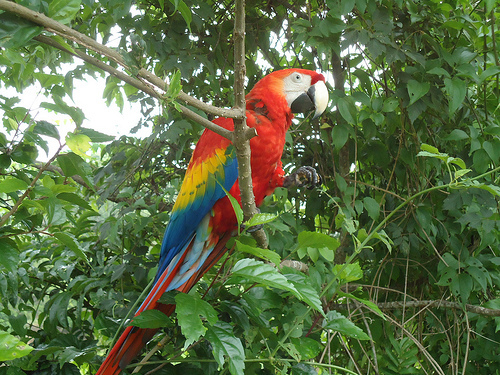 He apparently has other macaws and says they usually travel in pairs; this poor fella would not survive alone. Lee made sure that if someone tried to find it, he would release it to it’s rightful owner and he agreed. I’ve seen these at ZooAve but not in the wild like this….it was absolutely gorgeous – and yes, the colors are really that vivid! Lee also said that a hummingbird flew into the casita she uses as her wood shop (yes, the woman is amazing!). It was on the window and she quietly and slowly went over to the window and gently wrapped her hand around it and took it outside to fly away! They have hummingbird feeders around their patio and there are constant hummingbirds at them. Just another day in the land of beauty! Costa Rican Birthday – It’s today! One year ago today, I arrived in Costa Rica to live! Can hardly believe that it’s been a year! Time flies, especially when you are learning to adapt to a new country and culture. Seems like a lot has been accomplished this past year….the first biggie was the arrival of the sea container with all our worldly possessions. A friend, Pat, was kind enough to go with us to get our Costa Rican drivers licenses – needed a physical and blood typed in order to accomplish this. Around this time we received notification of our expediante – meaning we were in the system to become residents of Costa Rica! Woo Hoo! Thanks to Monica, our residency attorney! Construction began on the bodega and getting the fence around the yard; after those projects were completed, the addition to the house began. Then October hit! The dreaded October that we hope to not experience this year. Over 35 inches of rain, on our little patch of the mountain! And yes, during the construction….with the dogs and mud, and having no reliable internet….let’s just say things were a little testy! At one point I informed Mark that if we didn’t have decent internet by Nov. 1, 2011, I was headed back to the states and when we had it, he could call and I would come back! Alas! It didn’t happen! The going back to the states, I mean. CR WIFI came through – good internet, and the most delicious thing of all, I didn’t have to go into town to make phone calls! Had two different sets of company during this time…felt badly that they experienced Costa Rica during this epic rain month! Amy has since returned and been able to experience the beauty of the weather and scenery. When she and Todd were here last October, I don’t think we ever were out of the clouds. Now to get Todd back to see the beauty! 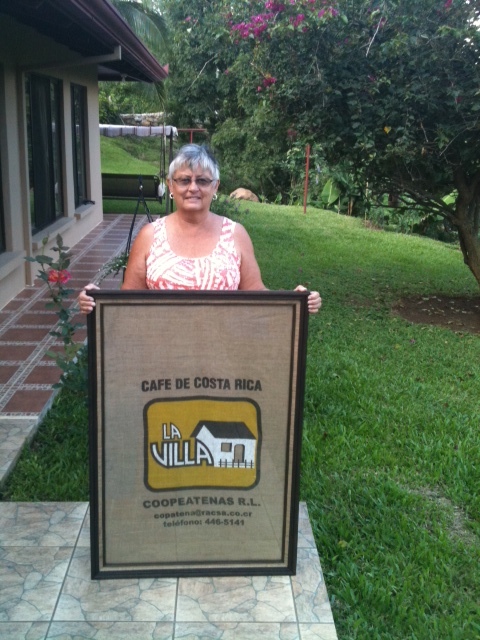 And Bill and Sandra were in Costa Rica for a nephew’s wedding and then spent a few days with us. Sandra and I love putting puzzles together….I bought a puzzle table to bring down because I knew I didn’t have the “counter/table space” to work a puzzle….by the time the puzzle was done, the pieces were twice their size because of the humidity! LOL Anyway, we hope they return to see Costa Rica in it’s finest. Had a little Christmas party, which will be an annual event. Yes, I put up 2 Christmas trees, one in the living room and one on the rancho – who cares if they were about 6 feet apart. It was festive! We attended many parades in town, the Christmas parade being the highlight! Talk about a “drum parade” – I thought opening a “drum store” would be a perfect business…all those broken drum sticks, etc. In February we received notice that it was time to head to San Jose and receive our Cedula’s – our cards showing that we were now residents of Costa Rica! We DID NOT give up our U.S. residency. This just means we do not have to make border runs every 90 days! Because of Monika’s efficiency, as soon as you receive your expediante papers, you do not have to make the border runs….we didn’t have to do this, even one time! WOO HOO! And yes, we will be voting in the presidential election! We’ve met many new friends from all over the world since living here. Quite a few of us are here because we couldn’t afford to retire in the U.S. So far we are more than pleased with the health care – and the weather, it’s great! Still hard to believe we are so far south and need no A/C….we do use fans. Having windows open is a novelty for us and we love it! Do we miss “the comforts” of the U.S., yep! But you know what, learning to get along with a little less isn’t bad – except when I’m in a creating mood and not sure of where to shop to get the “stuff” I need! Then I do tend to throw a hissy fit! Public transportation (buses) is efficient here and I’ve been learning to do this, thanks to a ladies group I belong to…now to get Mark on one. Next year the goal is to be able to speak Spanish! I know words and can usually get what I need across to whomever I am speaking to….I have trouble putting sentences together. I’ve figured that we’ve had “company” for 6 weeks so far since last October! We’re not that far from the airport so it’s not a big deal to pick up people. Our house is small but when most of your living is done outside….well, it’s a great big outdoor living space! I never in a million years thought I would enjoy living in the country – on a gravel road! But when we head into town and hear all the noise, horns honking, car alarms going off, music blaring….we are always happy to return to our little piece of the mountain and the quiet – we have adapted to hearing the birds singing, the cows mooing and the howler monkeys howling – so much more peaceful…except for our barking dogs! Wowsa! Another great day in Costa Rica! Comments Off on Wowsa! Another great day in Costa Rica! Bruce called this morning and said that he and Frances were going to Sarchi to the mattress/bedspread factory and wondered if I wanted to go along. I said, “sure, as long as I can stop in Grecia and pick up the coffee bag that was framed”. Off we went! Altho, I thought I’d never get into town because I was following a truck loaded down with tree trunks; I think going down hill we might have reached 10 mph. Stopped in Grecia on the way to Sarchi and the place was closed for lunch. I still have a hard time thinking that places actually close for lunch. Arrived at the factory in Sarchi and they were closed for lunch. So we went to the Oxcart Factory to eat in the cafeteria above the souvenir shop. Today was a “buffet” menu. Beautiful tables and hand made chairs to sit at….wish Mark was with me. Anyway, today’s meal for me, consisted of chicken lasagna, beets and plantinos (I’m sure that’s spelled wrong). Was pretty good, but not as tasty as chicken lasagna from Antano’s! After eating, I wanted to check out the painting classes they offer. Dope slap me! It has to be the best bargain in Costa Rica! You get a small (5″ or so) wagon wheel to paint on, the instructions and the paint, brushes, etc. for a grand total of $5 per person!!! I cannot wait to do this. They said it takes about 45 minutes to do it….I think I’ll be a frequenter painter there! We’ll be doing this when Terri comes! And if I can convince other people to go, it could be on the “tour” of things to do. Then off to the mattress factory; Bruce couldn’t find the bedspread he wanted in a queen size, so, voila, they are making it for him! I am fascinated when going into the factory and watching what they do. I did buy some pillows…. Coming home on the old windy road, a huge high truck was coming around a corner and with Frances’ driving skills, we were not hit head on and decapitated! Whew! Great day….and am excited about the painting class at the Oxcart Factory!!! Met up with Pat and John this morning to go to a craft show in San Antonio de Escazu. What a bust! No more than 6 – 7 vendors and nothing out of the ordinary….disappointing to say the least. But it was up HIGH in the mountains. It’s always interesting to drive through different neighborhoods and see “how they live”. Heading home, Pat thought we should go to this Mexican restaurant; but it wasn’t open yet….as we went past Multi Plaza, John made reference to buying a gun; we all agreed that he should turn around and go gun shopping! I guess you could say this was a “virgin shopping excursion” for me. I have never been in a gun store! It was pretty interesting!!! And the back wall was full of automatic weapons and short shotguns, all different sizes! And before we left the store, someone was looking at one of these! I’m not sure these are legal in the U.S.
John found his “gun of the day” and made a purchase. However, he did not buy the Magnum pellets and I told him that he should always buy anything that has Magnum in the name!!! He assured me he would go to Vargas, the local hardware store, and see if they had them! I certainly hope they do. Not sure what he’s going to shoot, but I know it won’t be Pat! She’s too good of a cook and he likes to eat. Pat decided the Mexican restaurant would be open now, so that was the next stop. However, I cannot remember the name of it, I hope she’ll post the name. But, I know the way to get to it! It was so neat looking inside!!! Yep, I should have taken some pictures. Baskets wired together with lightbulbs in them for lights! Really clever! We will not be strangers at this restaurant! Arrived home before the rains this afternoon. The neighbor girls, Dylana and Nazareth came to see Mark and wish him Feliz Dias del Padre! Maricela had made some Picadilla and chicken for Mark. Picadilla is a potato-type hash that is so darn delish! It’s nice to have Tico neighbors! June 7th we were at the airport to pick up Amy (daughter) and her friend, April. They were here for a week enjoying the sites and fauna of Costa Rica. They enjoyed the visit at the Lighthouse Animal Rescue Shelter – Amy was in awe of how many dogs were there and there was no growling or fighting between the animals. For one thing, Frances wouldn’t put up with it! LOL There were some clouds so they didn’t get to experience the “real view” from there. On Friday we headed to the Feria in town; I can certainly see a difference in the attendance since many ex-pats have returned to the states for the summer there. Sunday saw us headed to the Multi-Plaza in Escazu to dream and wander thru the upscale stores. There was an ecological event and “crafts”! Had I known it was there, we would have gone on Saturday. Many vendors were “low” on their merchandise; however, it didn’t stop us from purchasing some things. Monday, April and I went to Grecia and Sarchi. Amy didn’t feel up to it so she stayed home with Mark and they enjoyed a lunch in town. In Grecia there is a church made out of an old iron battleship from Belgium; pretty spectacular and beautiful inside. However, we couldn’t get in…we could hear the organist playing away; not sure if there were some services going on, but every door to the place was locked! I was disappointed that April didn’t get to see the inside. In Sarchi we saw the world’s largest Oxcart and then headed to the place where they are made. Some of the machinery that is used is from the early 1900’s and turned by a huge water wheel. It’s really quite spectacular to see. The man working downstairs was very eager to show us some things and even started the water wheel churning so we could see how it “turns” the machinery. Tom and Lee had invited us over for drinks; they have a view that is to die for also….from both sides of their house! Then we were headed to Bar Ril for dinner (home of the $6 lobster); however, they were closed so we ended up at Guanacaste. Tuesday was the day we headed to Playa Dona Ana (I’m sure that’s misspelled) – otherwise known as the monkey beach. April spotted one very high up in the tree and after waiting and waiting and putting out bananas to entice them, we left – didn’t see any that day! We also stopped and had lunch at Art’s Deli, sounds really Tico, doesn’t, it? It’s attached to Mola’s Gift Shop – tourist buses stop there a lot; I don’t know how they survive because people wander and wander through the shop, but you hardly ever see anyone purchasing something! Amy and April left yesterday. They made it home safely! I’m sure there were two exhausted gals last night. We really enjoyed their visit and glad that Amy took the time to come back again. She and Todd were here last October, the worst rainy October EVER! While wasting away many, many, many hours on Pinterest, I am pleased to recommend an itch relief I found on that website. Dry bar soap, meaning no water on the soap, and a bug bite are all you need. When that pesky bug bite starts itching, take that dry bar soap and run it over the bite. Voila! Mine stopped itching! Hope it works for you!!!!! From the land of many different itchy bug bites!